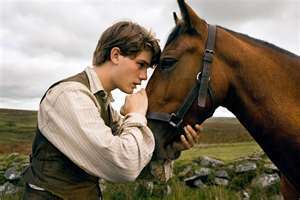 War Horse is the latest live-action drama by Steven Spielberg. It was originally a children’s story written in 1982 and later adapted into a stage play which debuted on Broadway in 2011 and even won a lot of Tonys. Now War Horse comes to the big screen and it’s only right that Steven Spielberg be the one to create it into an epic movie. The film opens as young Devon boy Albert Naracott watches the birth of thoroughbred colt and watches him grow up. The colt would become his, but at a cost to the family. The father Ted wins him at an auction at an enormously high 40 guineas, thanks to his intent to spite his landlord. The high price would cause him to miss his rent and he would have to pay by autumn. That’s not an easy thing for Ted as he has an injured leg from the Boer War for which he’s not proud of and drinks to hide his guilt. He even hides his medals away. Meanwhile Albert grows a friendship out of the horse whom he names ‘Joey’. Each time Ted threatens to shoot the horse, Albert tries to prove Joey is worthy of staying. Albert trains Joey into plowing the farm and succeeds in having it all plowed in a single day. However the farm fails because of heavy rain and Ted sells Joey to an Army Captain as World War I has just started. This breaks Albert’s heart and he even tries to enlist, even though he’s underage. However Captain Nicholls ensures Albert Joey will be fine and will make it home. Albert even ties his father’s war pennant to Joey’s bridle. Joey is trained for battle and faces his first battle with Nicholls on top against the Germans. The Germans however have the latest artillery which are capable not only of killing horses from far away but making horses now useless in war battle. Nicholls is killed in battle but Joey is one of few horses to survive, only to be captured by the Germans and used as an ambulance horse along with Topthorn, a black horse whom was trained by the British. Joey and Topthorn become friends. The two horses then become owned by two young German brothers who plan to desert the army and flee to Italy. Even though they hide themselves and the horses in a French windmill, the brothers are discovered by the German soldiers and executed by firing squad. The two horses are discovered by a French farm girl named Emilie, an orphaned girl who has brittle bones and lives with her grandfather. They soon become hers and she’s able to hide them successfully after German soldiers raid their house and take their food. She finally rides Joey on her birthday only to have the horse stolen by German soldiers. The horses are then put to the task of pulling heavy artillery. Joey and Topthorn are the only two pulling horses to survive this. Meanwhile it’s 1918 and Albert is now a soldier for Britain. He and his allies are wounded by a mustard gas explosion in German trenches. Joey and Topthorn are still alive after years of brutal labor by the Germans but Topthorn can’t take it anymore and dies. Soon after, Joey tries to flee and advancing tank only to end up tangled in barbed wire and fall down in the mud. A British and German soldier clip off the wires together and the British soldier wins possession of Joey in a coin-toss. While Albert is recovering from his gas attack, he learns the story of the miracle horse. Meanwhile Joey is to be put down because he is too injured. Just before he’s to be shot, Joey responds to an ‘owl call’ from Albert. Albert and Joey are back together again but it doesn’t end there as there is still the auctioning of the war horses. What happens after is something for you to see for yourself. One thing about the movie is that this, like a lot of epic films, does not have that stellar of a script or of acting. The script is good in how it takes one through the adventure from one place to the next with its various twists and turns, but nothing really deep. There are even times in which it comes off as fluffy as a movie-of-the-week script. The acting is flawless but nothing of any real challenge either. There was no real actor that stood out with Emily Watson being the top billed actor of the film and newcomer Jeremy Irvine being the lead human protagonist. The acting roles are well-played but often end up as cardboard as your typical acting in an epic movie. The lead role and the protagonist in the movie is actually Joey the Horse. The story may mainly be about Albert trying to get Joey back to Devon but it’s Joey’s adventure and trials of it all which is what the story is all about. He goes from being born to Albert’s best friend to a horse in battle for Britain to befriending another war horse named Topthorn to a horse on the German side to being a horse of a French farm family to being back with the German side to being found stuck in barbed wire to being reunited with Albert. I may have knocked the script a while back in my review but I have to say one of the best attributes of the script is that it was able to make Joey into a horse with feelings without coming across as cheesy. That scene where Joey says his last goodbye to the deceased Topthorn didn’t come across as cheesy or manipulative. Also the movie ends with some unexpected twists and turns. Just when you think Albert and Joey are finally reunited, it doesn’t guarantee Albert will be taking him back to Devon. Interesting note is that the scriptwriters worked with Michael Morpurgo, author of the novel, to get the right adaptation of the movie. Although the script and the acting are not the best attributes of the movie, the cinematography, set design and the accompanying score are the best technical qualities. Spielberg picked out some of the best and most appropriate areas of England for filming this movie, including Devon for the countryside and town scenes, Hampshire for cavalry scenes and an airfield in Surrey for the battle scenes. Janusz Kaminski did an excellent job of cinematography. His cinematography duties for this movie were complex as he had to both capture the grittiness of war for the battle scenes and capture the glamor and beauty of the countryside for the various country scenes. Plus you can’t go wrong when you have John Williams to compose your movie’s score. However the best overall attribute is its ability to capture battles of World War I. Steven Spielberg is already known for his movies that depict wars and it only seemed right that he should be the one to recreate World War I in this movie. Here, he doesn’t disappoint. He’s able to recreate everything from the horse battles to the ground artillery to the trenches of the World War I battles to the first tanks. He also shows the grittiness of war too with the laying of the dead horses in battle to the execution of boys not yet adults to the rats in the trenches to the explosion of mustard gas bombs. Grittiness of war is something Spielberg doesn’t avoid and he doesn’t avoid it here. It’s also interesting noting the horse statistics of World War I that Morpurgo researched to create the War Horse novel. It is believed that there were 10 million horse deaths during the whole war. Of the one million horses sent from the UK to battle, only slightly more than 60,000 returned alive. The rest were killed in battle or slaughtered in France for meat. So War Horse is quite a story of survival. War Horse may not deserve to win Best Picture as its acting performances, direction and script lack the winning edge but it’s a very good movie on its own. It’s a good family drama for families with older children. I commend Steven Spielberg for making the adaptation of this children’s novel possible on the big screen. DISCLAIMER: Okay, I know I’m behind in my writing and my movie reviewing. This has been a summer where I’ve tried to relax as possible so please excuse while I play catch-up here. It’s the summer: the time when Hollywood producers, directors and film companies compete for the #1 grossing movie and the top moneymaking film company. It’s always at the box office where they decide the tried-and-true from the tried-and-tired. Despite the intense competition, there’s always a movie that comes with modest expectations that surprises everyone and steals their attention in the end. Super 8 is a movie that came with no top billed cast, Steven Spielberg acting only as a producer, and directed by little-known J.J. Abrams. Nevertheless it surprised everyone who saw it and gave them more than their money’s worth. The movie starts as Joe Lamb’s mother had died on the job at the steel mill in an Ohio town. His father, the town deputy, is not taking it that well and even arrests Louis Dainard, the town bad apple. Four months later, school’s out. Joe’s father wants to send him off to a baseball camp in Pennsylvania but Joe’s more interested in making a zombie movie with his friends. This is a film director Charles Kaznyk wants to make to win a Super 8 film competition. He convinces Alice Dainard, Louis’ daughter, to play the protagonist’s wife in the movie. Alice steals her father’s car and takes the group to a train station to film the scene. During the shoot, a train passes by which the crew hopes will add more to the story. During the passing, Joe notices a truck driving towards the train, colliding, and derailing the whole train. In the aftermath, the kids come across a lot of explosions from the train cars and unique white cubes amongst the debris. They also find out the man who hit the train was their biology teacher Mr. Woodward who instructs them never to talk of what they saw or they and their parents will be killed. Just before the children flee, they learn that the Super 8 camera was untouched during the crash. Later the U.S. Air Force arrives to take over the crash scene. Over the next two days, strange paranormal phenomena occur like people and dogs disappearing, power lines vanishing, missing electronics and even a gas station destroyed by something unknown. Woodward, recovering from the accident, refuses to answer the Air Force any questions and he is poisoned by a soldier. The Air Force has complete control of the town and its people, even deliberately starting a wildfire to evacuate the whole town. The town relies on Joe’s father to assure them of their security and answer their questions. In the meantime the kids try to use some of the events as catharsis for Charles’ film, including using one evacuation scene for shooting. They also try to look for clues to this whole mystery. The first clue comes in the developed film used at the train station shoot. They notice something bizarre, like bugs. Later after Alice is amongst the missing, they break into their school and search for any of Mr. Woodward’s items that may have clues to this creature. What they find is a film and audio recordings about a creature that crashed to Earth in 1958. The alien only wanted to rebuild its ship but the Force tortured and imprisoned it to take its technology. One film even showed Woodward attacked by the alien only to form a bond. Woodward crashed into the train to free the alien. The Air Force capture the boys and place them on an Air Force bus heading back to the base only to be attacked by the alien. The alien kills the men from the Air Force bus with allows Joe and the boys to escape and return back to the town. The boys return to town which is under heavy fire from the malfunctioning military equipment. They find a subterranean lair near the cemetery where Joe’s mother is buried. They come across many missing people still alive, including Alice, in which the alien was planning to have for food. They also learn the town’s electronics are underneath the base of the water tower formed together in which the alien is hoping to build a machine to return him back to his planet. Joe rescues Alice but in the escape, Joe is caught by the alien. Joe tells the alien that he can still live on after the painful events. The alien understands him telepathically and allows Joe and his friends to escape. Soon after, all the loose metal, including the cubes that break free from the Air Force transport truck, are attracted to the town’s water tower. The cubes align and a ship forms allowing the alien to enter and finally leave earth. During the end credits, we see the film in which Charles, Joe and his friends created. A fun zombie movie filled with simple effects and gory make-up. The movie is not just about an alien breaking free from the Air Force captivity. It also has a lot of human elements and themes. One theme featured is about parent-child relations. The town sees Deputy Lamb as a hero but Joe sees him as someone who has alienated him ever since his mother’s death. Alice Dainard thinks her father’s a monster. Things turn for the worse as she befriends Joe and her father forbids him. Another theme is about trying to heal from the past. Deputy Lamb blames Louis Dainard for his wife’s death since he didn’t show up for his shift that day. Joe also keeps the locket of him as a baby in which his mother wore until her death. Another theme is about the growing pains of adolescence. Charles hoped using Alice in his film would attract her to him. Instead she develops a bond with Joe. That puts a hot spot in the friendship between Joe and Charles with Charles feeling like the misfit again because he’s overweight. This was one sci-fi film that had a lot of depth in its script that worked well with the movie. One of the best things about this movie is that it will remind many people of Steven Spielberg’s thrillers of the past. I’m sure most of you have a favorite one: Jaws, Close Encounters of The Third Kind, Poltergeist, E.T. : The Extraterrestrial, Gremlins, The Goonies. They captured people’s imaginations and dazzled viewers looking for an escapist thrill. Here in Super 8, we can see a lot of the Spielberg magic captured with the storyline, the special effects and the thrilling sequence of events. That’s what makes for a winning story. Many people can already see many hints of Spielberg’s past movie’s in Super 8. I’m sure if you see it or have seen it, you might too. The best thing about the movie has to be the lack of star-billing in this movie. Here the main characters are the children. The adults are in minor roles. They are all great individually but its their unselfish performances together where the acting shines best as a whole. J.J. Abrams’ direction is also excellent. He was very good at taking the story he wrote and turning it into a thrilling movie that is as generous with its storyline as it is with its thrilling effects. With Spielberg acting as producer, I’m sure that J.J. Abrams could rightfully label himself the heir apparent to Spielberg. The visual effects definitely could pass as some of the best of the year. The mix of music with 70’s hits and the original score of Michael Giacchino was also excellent. Overall this was an excellent movie. In terms of its business, Super 8 cost surprisingly over $50 million to make and even had a video game released with it. As of now, the film has grossed $125 million in North America and just over $200 million worldwide; not enough to rank it even in the annual Top 10 list of highest grossing movies. I really enjoyed it. I feel sorry for those who missed out on it. It’s also surprising to see that something like this about an alien invasion of such would draw and captivate moviegoers in the late 70’s but doesn’t seem to do so now. Super 8 is an excellent summer movie that the viewer would expect little of but would leave the theatre amazed. This definitely has to be one of the best summer movies you could see. It may not look like your type of movie but if you give it a chance, you might be surprised.